We want to share with you all an amazing story that we have had from one of our customers. Here is her journey written by Maeve herself. Marking the year anniversary of when I started my road to recovery it only seems fitting that I would start to write my story. What began as a short sentence of how Cellnutrition helped me in their Beauty Lies Within campaign has given me the confidence and motivation to finally share the full story of what I went through. I am very nervous about sharing this, with slight feelings of vulnerability, but if my tale of depression, alopecia and recovery can even help one person, give them confidence and know that they can get better, I feel like this bare all will be worthwhile. I saw on the Instagram page for Cellnutrition that they were doing a beauty lies within campaign, and with a little confident kick up my own bum I submitted my answers along with pictures of my alopecia and how it has grown; But before I skip straight to the end of this tragic tale between a sad girl and her hair, I must start from when the hair was nicely attached to my head. Without really knowing it I was depressed for years. I had an unhealthy way of thinking, and it wasn’t till I changed my mind frame that I truly realised this. I really didn’t know enough about depression and anxiety to know it was what was wrong. I thought it was just my personality, my normal. I was feeling down a lot, very low lows, but I would have times of complete highs, so that’s what lead me to believe I wasn’t depressed. I was wrong. I was losing pleasure in everything. The only times I felt really happy was when I was drinking and socialising. It was my mood elevator, my temporary high. I was just trying to escape. I was tired all the time, no concentration, lots of tears, finding it hard to fall asleep but then not waking up all developed into feelings of extreme guilt, holding onto the wrong people and the wrong friends. I was extremely irritable, nit picking, over eating, under eating, anger episodes which lead to OCD and eventually panic attacks. My anger episodes were happening at home, I lived with my boyfriend at the time and three other people. It was hand in hand with the OCD I had that I didn’t know I had. If things weren’t clean or things were out of place I would get so upset and cry and clench my fists, sometimes scream and more times than once I would break something. And minutes even seconds later I would completely regret it, it was as if someone else had taken over me, and that would upset me and bring me down even more. I was having slight panic attacks from 2015. Anger attacks were like someone was taking over my body, panic attacks for me felt like nobody was in control. They started to become a worry for me in September 2016 when I had a panic attack so hard that I passed out. They were starting to affect my job. 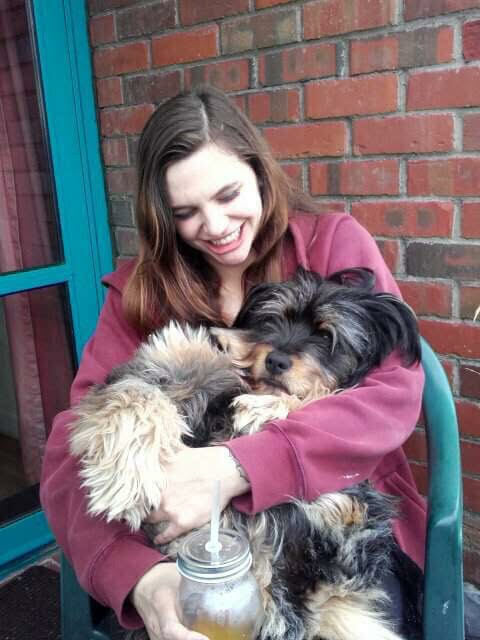 At the start of April, I broke up with my boyfriend of three years. I was desperately unhappy. 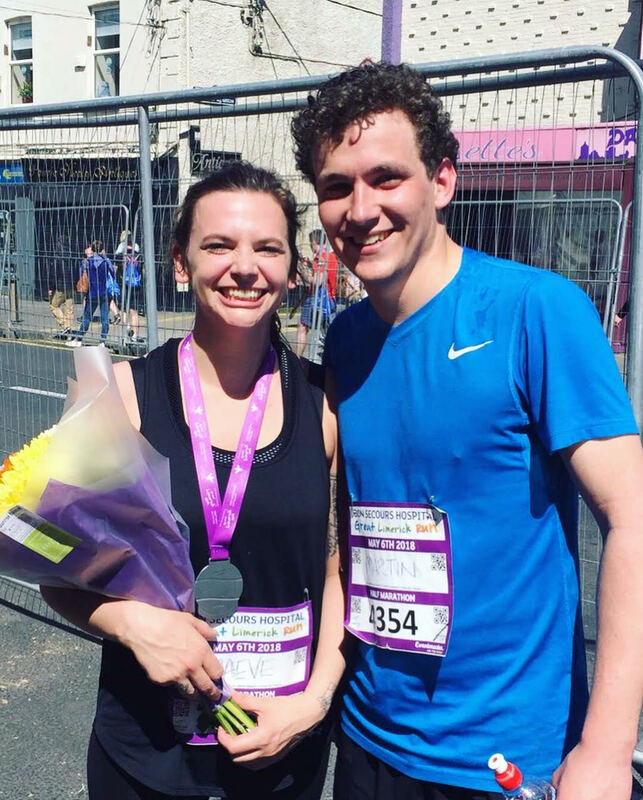 I was unhappy in myself for quite some time and I think I clung to our relationship more as a fear of being alone, so breaking up was a huge step for me and ultimately where all the major changes began. On the night we broke up my sister came over, and I for the first time ever said the words ‘I’m not ok’. She suggested that I tell my parents, and with lots of worry, a massive fear of letting them down, and major anxiety about the whole thing, I told my parents. It was as if telling my parents made it all real, it was as if telling my parents opened up a massive wound in my chest that I had kept plastering over bit by bit and the whole thing collapsed, I was exposed, my secret was out in the open. It was when depression really started to hit. I went to my GP and told her everything and she gave me the contact details of psychologist that she thought would suit me. Unfortunately, things for me started getting worse before they got better. Mid-April I had a panic attack in work and had to quit. I don’t think anyone really knew, I’m unsure, I never asked. I left too quickly for them to ask. I said I wanted to focus on my music to avoid any questions. I was just not coping well with any stress or pressure at all. I was crumbling. I used to own a café, I lived for pressure and stress, I nearly worked better with stress. I was not myself anymore. Just one week after leaving my job I got asked to leave my house of nearly three years. Everything was happening at once and it was a lot for me to handle. A lot of people didn’t like me after the break up and I was very isolated going through one of the hardest parts times of my life. I started to see a psychologist where we worked through my issues together. 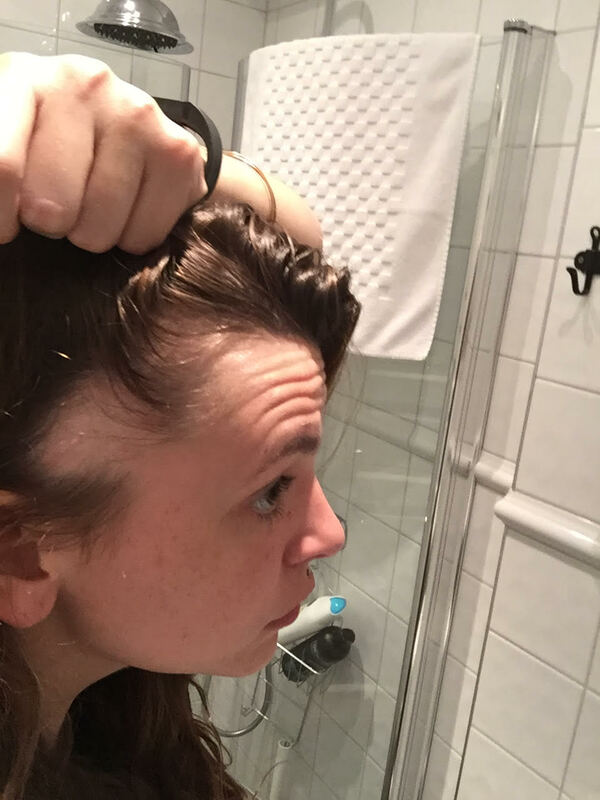 In June I noticed a small bald patch on the top of my head. It was a frightening discovery and I thought it was so crazy how negative thinking and stress can start to manifest as real physical problems. 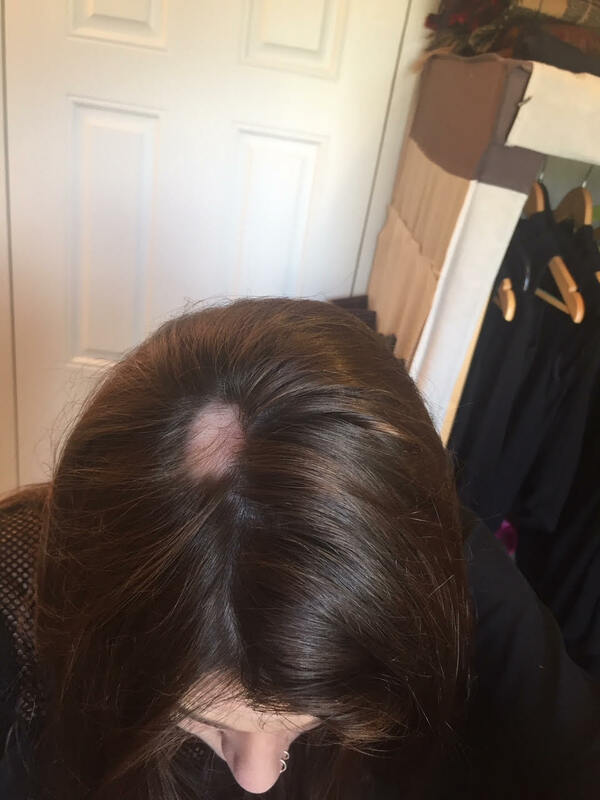 I had bad back pains, IBS and now alopecia. I was upset at first of course, but I knew that I really had to focus on getting myself better. It was a rocky road, another bald patch and antidepressants but I started to feel my moods lifting and I began to see clearly again. 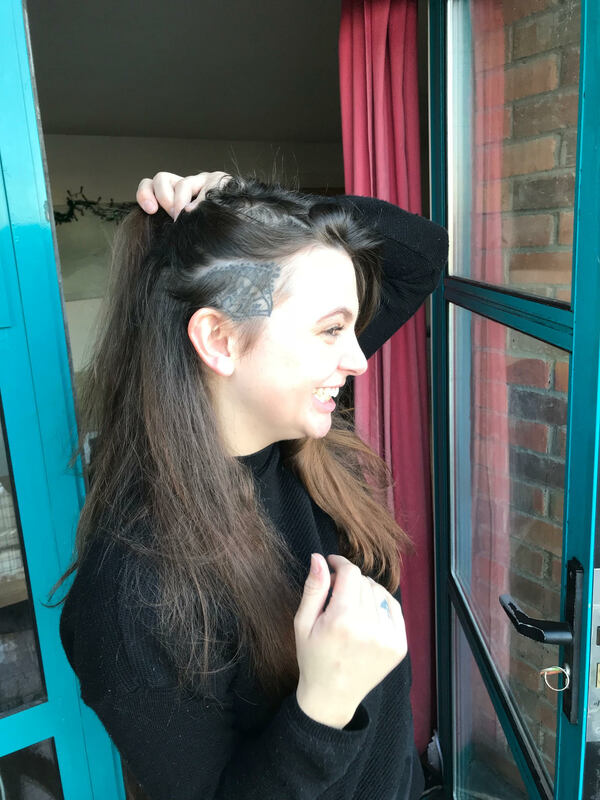 I spent so much time trying to hide my alopecia and I found a way for it not to be a big deal was to tell people and show people and talk about it. Of course, there was a lot of negativity, people saying I was attention seeking and the likes, but I had to focus on me now, and if talking about it helped me then that is what I was going to do. 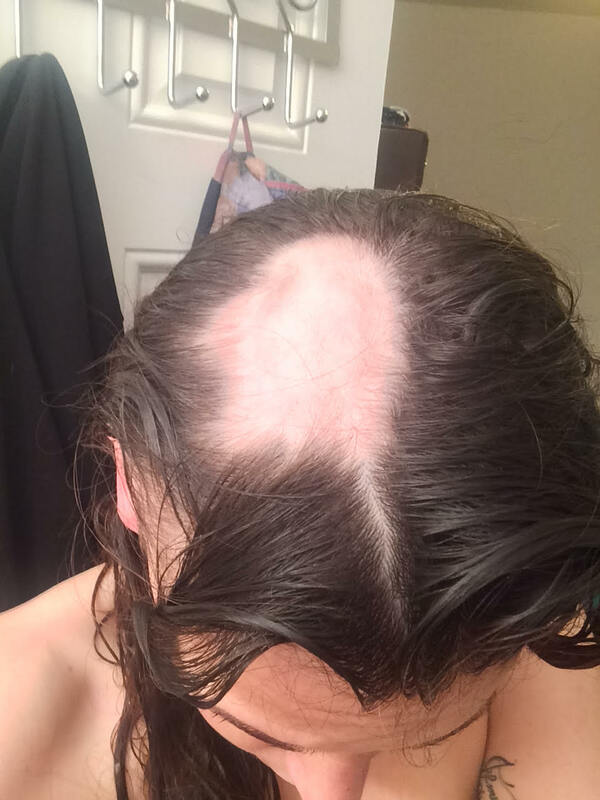 My alopecia grew, and I really believed it would never grow back. Even though I was beginning to feel better, my bald spots still grew in size. 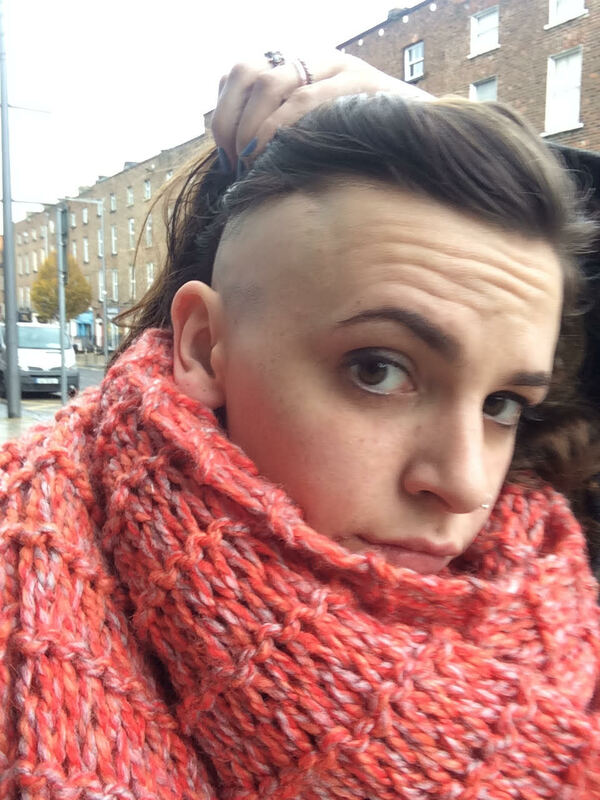 The one on the side of my head was like a baby’s bum. I started working again. Big step for me to go back to work. I decided to not go back into restaurant work just in case the pressure would get to me again. Even though I was getting better I was, and still am, very sensitive to pressure and stress. It can send me on a spiral of thoughts. I found the perfect job, and they hired me. It is for a French patisserie, La Patisserie by The French Table in Limerick. It was really the perfect job for me. Arranging all the pastries out perfectly realised the OCD still in me, I love it. 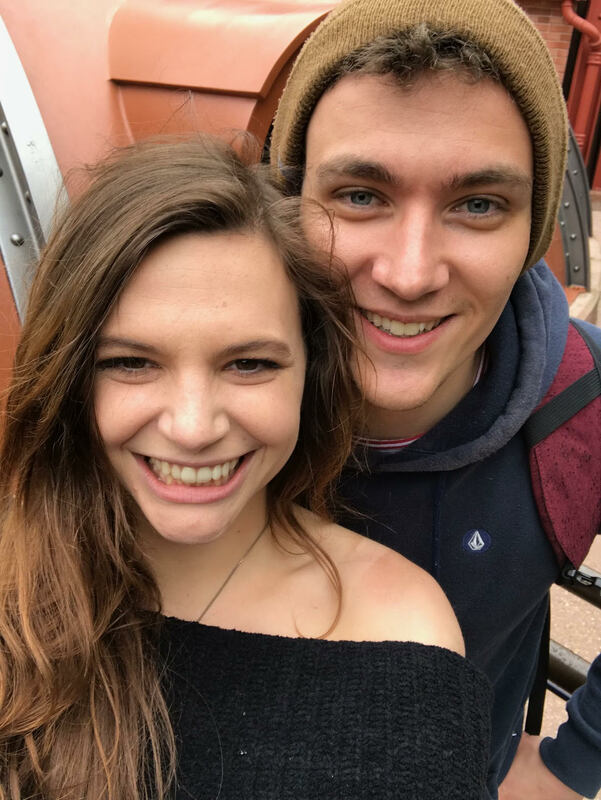 Through my new job I met a lovely French man who I have now been with for 6 months, and we just moved in together. I love my job even more now. I was very open with him from day one about what I had gone through and showed him my bald patches and he feel for me anyway, and I him. 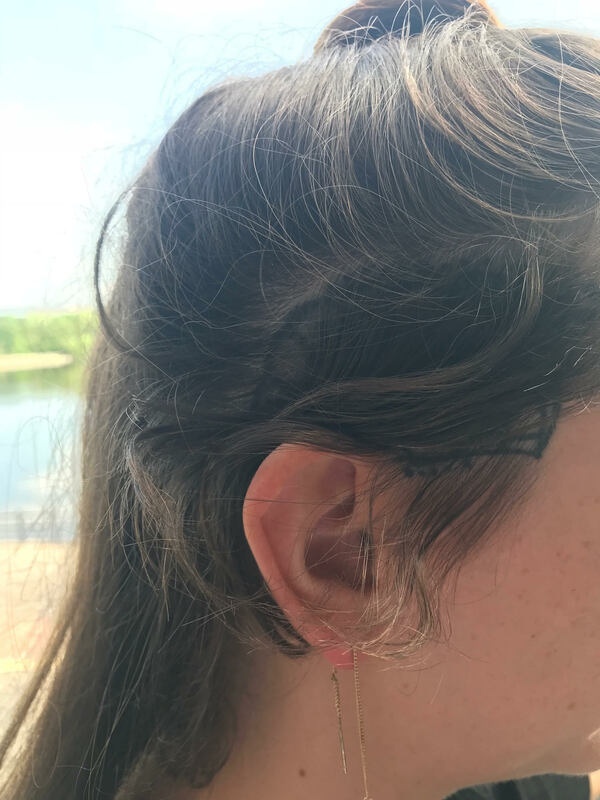 It was when we began seeing each other that I decided to get a tattoo on the side of my head. There is some reports that irritating the alopecia area can cause the sleeping cells to wake up. On the other side, if it was going to be bald forever it may as well be interesting. I have tattoos already so getting a tattoo isn’t scary for me, but this one was completely different. I have a tattoo for a friend of mine who passed away and hat was an emotional one, and an expected emotional one, this one was completely unexpected. As soon as I sat down I began to cry, and it wasn’t sadness for once, it was an overwhelming feeling of happiness. I was so proud of myself for how far I had come mentally, and this tattoo was like a mark of that. It is so hard to explain the feeling. I had the same feeling recently when I ran the half marathon in The Great Limerick Run. I felt happy in myself. Getting that far was so so tough but I pushed myself to find me, and to find my inner beauty and peaceful state of mind. 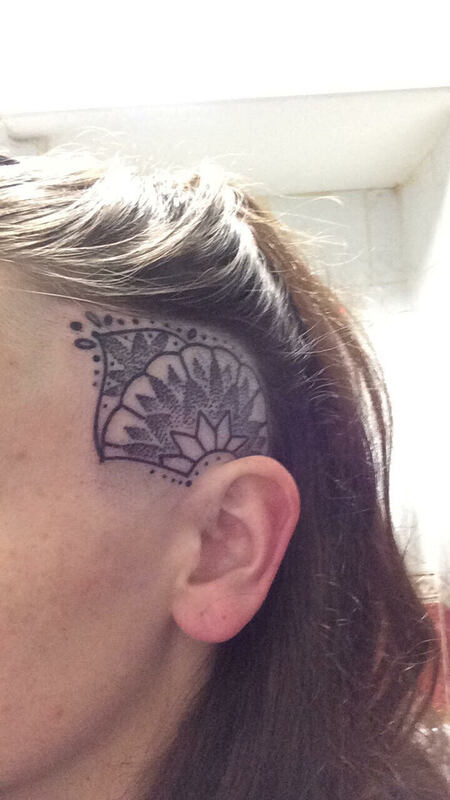 The hair didn’t grow back after the tattoo, but I didn’t mind. I even thought about shaving my hair completely because of the growing bald patch but after taking Cellnutrition I am so happy I didn’t. My IBS was still very bad, serious bloat after eating the wrong foods, swelling and feeling very run down and tired. I follow Maeve Madden on Instagram and I saw that she was taking the Hypertonic in the morning and the Isotonic in evening. 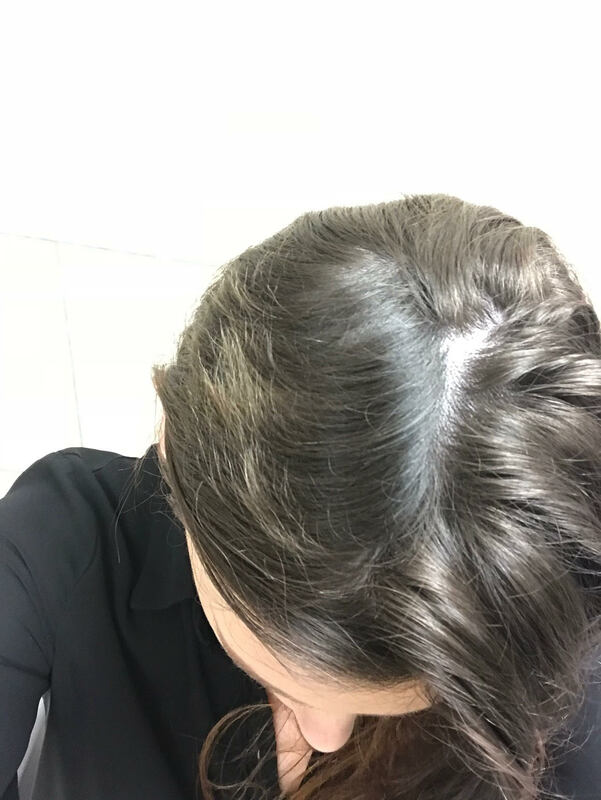 I started taking it for my IBS and I couldn’t believe that within a month my alopecia patches were growing. Alopecia is when the cells are dormant and Cellnutrition must have woken them up. Not only has it helped my hair and my IBS but my moods have levelled off. I can’t recommend it enough. I have confidence again. I have hair again. I am not saying that there is a magic solution to everything, I am sure that if I was still in my bad state of depression my hair would still be gone, but with my recovery and the Cellnutrition it was a perfect combination for me. I am not saying I am better, what is better? I have my highs and lows, some more than others, but I am more aware of when I am up and down and the reasons why. I know my triggers and I just try to live the best life for me every day. It is a battle that I am willing to keep fighting.